The physical principles involved in a frontal collision are relatively simple. 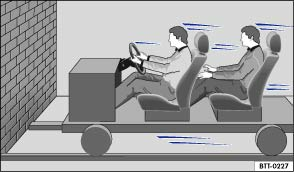 As soon as the vehicle is in motion , both the moving vehicle and its passengers gain kinetic energy. The higher the vehicle speed and the heavier the weight of the vehicle, the greater the amount of energy that will have to be released in the event of an accident. However, the most significant factor is the speed of the vehicle. If the speed doubles from approximately 25 km/h (15 mph) to approximately 50 km/h (30 mph), for example, the kinetic energy increases by a factor of four. The amount of kinetic energy depends on the speed of the vehicle and the weight of the vehicle and passengers. The higher the speed and the heavier the weight, the greater the amount of energy that will be released in the event of an accident. Passengers not wearing seat belts are not connected to the vehicle. In the event of a frontal collision they will continue to move forwards at the same speed at which the vehicle was travelling before impact, until something stops them. 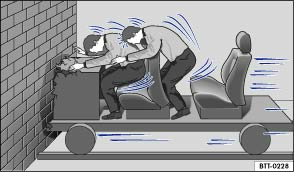 Because the passengers in our example are not restrained by seat belts, the entire amount of kinetic energy will only be released at the point of impact against the wall . Even at speeds of approximately 30 km/h (18 mph) to approximately 50 km/h (30 mph), the forces acting on bodies in a collision can easily exceed one tonne (1,000 kg). These forces are even greater at higher speeds. This example applies not only to frontal collisions, but to all accidents and collisions.